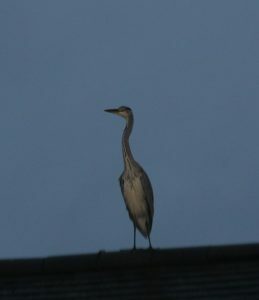 Heron disturbed by Lesley Hartley near her pond at Bridge House, Black Lane, just before dusk on Tues 21 Nov. It flew up onto the roof of Gerry Bailey’s house where Ivan Kent took the snap. 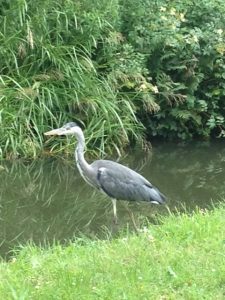 Also an excellent photo of a heron taken in July 2017 by Teresa Oakes on the Froghall Canal. Last week, on two separate occasions, there were sightings of large flocks of starlings in the Whiston area (sightings by Gerry Bailey & Ivan Kent). At this time of year vast swirling clouds of flying starlings, called murmurations, are seen in the late afternoon as dusk approaches as starlings gather and go to roost communally. Two local sightings suggest the roost is somewhere local in the Churnet Valley. In 2007 there was a huge roost in the trees at Whiston Golf Course, a spectacular sight. Does anyone know where this year’s roost is? If you see a large flock in the late afternoon please try and identify which direction they are flying in.